The Israeli Magistrate Court in Jerusalem ordered, on Wednesday, the eviction of a Palestinian family from its home in Silwan neighborhood of occupied East Jerusalem, for the benefit of Israeli settlers, according to Wadi Hilweh Information Center. 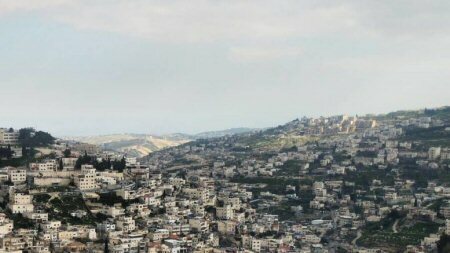 It said the court gave the family, which consists of one woman and her four children, until the beginning of March to vacate its home and 500-square meter land in Silwan, under the pretext the house was bought by the settler group “Elad” more than two decades ago, from heirs to Mariam Abu Zweir, who supposedly bequeathed her house, after her death, to her eight children. The Magistrate Court issued the eviction decision prior to a session for the High Court to rule on ownership of the land. Documents were submitted to the High Court proving that the land on which the house is built belongs to the late Jamil Siam, and not to the late Abu Zweir. The court has set the 8th of next month to deliberate on the matter. Abu Zweir’s heirs explained that they had been fighting a legal battle in Israeli courts, for 22 years, to prove ownership of the house and land and to refute claims, by the Elad settler group, of ownership of the property. Nihad Siam, one of the heirs, explained that Elad tried very hard, over the past years, to seize the property, mainly by colluding with brokers and people who took the fingerprints of the late Abu Zweir on a document in which she bequeathed her property to three of her sons, while she was on her death bed. In 1999, the Israeli courts rejected Elad’s claims and confirmed that the property belonged to Abu Zweir’s eight children. Siam further stated that Elad then made a new attempt to control the property by filing another lawsuit, in 2001, in which it claimed that it had purchased three shares in the property (the three brothers currently living in the United States, primarily from Mahmoud Daoud Khalil), and demanded that the remaining shares to be classified as “absentee property”. Siam said that, after several hearings in the courts, it was revealed that Elad claimed to have bought four shares from the heirs and that two other shares were classified as absentee property, leaving only two shares for the two late sisters Munira and Fatima. The court ruled, on this day, that the settlers own these two shares and that the family that lives there should leave the house and property by March. Siam added that his late mother, Munira Siam, his brothers and he had been fighting the settlers’ takeover of their home in the courts, which took the side of the settlers and prevented them from doing any renovation on the house and land. He pointed out that the family is getting ready to go to the District Court in Jerusalem to overrule the Magistrate Court’s decision, after the lower court gave it 45 days to object to its eviction decision.